It took a LOT of research to spend a Fortnight in 1916 – I spent almost a year accumulating information, reading diaries, and figuring out what was and wasn’t done. Despite all that, I’m still sure I made plenty of mistakes. One of the real frustrations for me in creating this project, and something that was part of the impetus for it in the first place, is how little published research is available on the New Zealand home front of WWI. 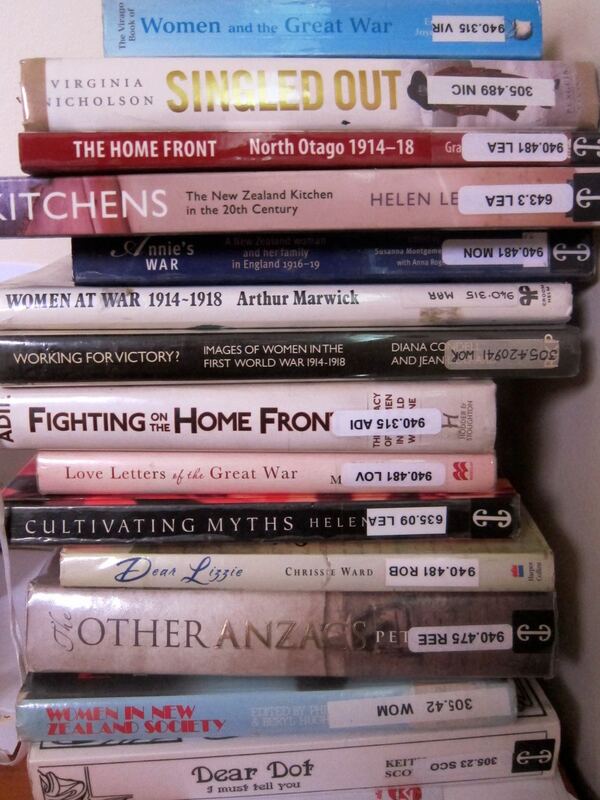 There are a number of books that have chapters on the timeperiod, and much written about the WWI itself, and the politics around the war, in and outside of the country, but not one that I have found about the NZ home front as a whole. The period of 1914-18 would have been a time of huge change within the country even without the war: so many new technologies are introduced at this time. I’d really love to see more research and writing focused on the domestic side of this period. Here are the resources I used, with notes on the ones I most useful and relevant to my research. I hope they are of interest and use to you! Papers Past – the National Library of New Zealand’s online database includes scans of almost every NZ newspaper dating back to the 1840s, and it’s searchable (and free!). It’s been invaluable in providing recipes, fashion advice, housekeeping advice, and pretty much everything else. The Museum of New Zealand Te Papa Tongarewa – their collections include numerous photographs taken in New Zealand during the war, as well as clothes and corsets from the period, providing an excellent image of what was available, and worn, in 1910s NZ. Complete Etiquette for Ladies & Gentlemen: A Guide to the Observances of Good Society. London: Ward Lock & Co. circa 1920. This ettiquette book comments on the societal changes created by the war. Jenkins, Herbert. Patricia Brent: Spinster. London. Herbert Jenkins Ltd. 1918. This WWI era romance novel, set in London, provides an interesting period look at courtship and manners, and is the sort of thing my 1916 counterpart might have read. Listen to it here. Kirkby, Mandy (ed.). Love Letters of the Great War. Very sweet, the letters are from both ends, so include a female perspective (hooray! ), but few are from NZ. London: Macmillan Press. 2014. Klickmann, Flora. The Flower-Patch Among the Hills. London: Religious Tract Society. 1916. Flowers and a bit of wartime gossip, though generally quite cheerful, as the book was published at the beginning of the war. Klickmann, Flora. Between the Larch-woods and the Weir. London: Religious Tract Society. 1917. In between the descriptions of flowers and gardens that characterise her books Klickmann turns her observant eye and wry tongue on the changes to society during war, from society hostesses cutting their staff from 14 to 9 (oh, the hardship) to government recommendations on how to save on corsetry. Montgomery, L. M. Rilla of Ingleside. 1921. This is one of the few fictional accounts of the war told from a female perspective, by a woman who had lived through the war. Norris, Susanna Montgomerie with Anna Rogers (eds.). Annie’s War: A New Zealand woman and her family in England 1916-19. The Diaries of Annie Montgomerie. Dunedin: Otago University Press. 2014. This is the only published contemporaneous account of the war from a civilian, NZ, female perspective that I have found. Unfortunately it doesn’t begin until 1916, and is begins when Annie’s family leaves NZ, and is focused on their time in England. It does give insight into clothing (Annie mentions sleeping in pyjamas for the first time, and keeps a detailed record of her shopping), food, medicine, and general lifestyle. Most interestingly, Annie is quite cynical about the war, extremely harsh in her opinion of the English as a society, and indicates a general awareness of how much the failings of the British military are contributing to the death of NZ soldiers. I did wonder, reading her diary, if the English press was less censored than the NZ press during WWI. Ward, Chrissie. Dear Lizzie: A Kiwi Soldier Writes from the Battlefields of World War One. Auckland: Harper Collins. 2000. If only we had Lizzie’s letters to her brother! France etc. is all very interesting, but I want to know about NZ. Punch: or the London Charivari. July to December 1914. It’s interesting to see the start of WWI, and how quickly ideas and attitudes change. By August 19th, for example, there are cartoons of German shops getting patriotic British makeovers. While British, Punch would almost certainly have been read in NZ at the time – albeit a few days late. Burgess. Fred W. The Practical Retail Draper: A Complete Guide for the Drapery and Allied Trades. Volume IV. London: Virtue & Company. circa 1913. 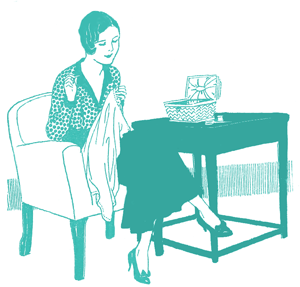 This guide to running a successful drapery gives a good idea of what it would have been like to go garment shopping in the 1910s. Fales, Jane. Dressmaking: A manual for schools and colleges. New York: Charles Schribner’s Sons. 1917. 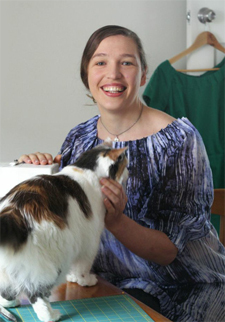 A useful source for period sewing and garment construction techniques. Belich, James. Paradise Reforged: A History of the New Zealanders From the 1880s to the Year 2000. Auckland: Allen Lane the Penguin Press. 2001. Gives an excellent socio-political overview of NZ and WWI. Leach, Helen. Kitchens: The New Zealand Kitchen in the 20th Century. Dunedin: Otago University Press, 2014. Like all of Leach’s books, Kitchens is meticulously researched. The preface, and chapters 1-4 (1900, 1900-1909, 1910-1919, 1920-29) the best available secondary resource which gives an overall perspective on houses, kitchens, and cooking in NZ in the first quarter of the 20th century. I highly recommend this book for anyone interested in food and cooking history, even if you are far from NZ. Leather, Graeme. The Home Front: North Otago 1914-18. Oamaru: IslandBridge. 2014. Leather begins his book by saying ‘It is not my job to pass judgement or draw conclusions’. He’s not kidding. While the book dutifully recounts what happened in North Otago during WWI, there is no overall critical analysis, and the same information can easily be gleaned from period newspapers. Scott, Keith. Dear Dot, I must tell you: A Personal History of Young New Zealanders. Auckland: Activity Press. 2011. Children’s letters to a newspaper personality. Adie, Kate. Fighting on the Home Front: The Legacy of Women in World War One. London: Hodder & Stoughton. 2013. Interesting, but from a British perspective. Bunkle, Phillipa and Beryly Hughes (eds.). Women in New Zealand Society. Auckland: George Allen & Unwin Australia Pty Ltd. 1980. Olssen’s chapter on Women, Work and Family: 1880-1926 was the most useful of the essays. Condell, Diana and Jean Liddiard. Working for Victory? Images of women in the First World War, 1914-18. London: Routledge & Kegan Paul Ltd. 1987. Helpful in showing a less glamorised image of the war, but (once again), from a British perspective. Coney, Sandra. Standing in the Sunshine: A History of New Zealand Women Since They Won the Vote. Auckland: Penguin Books. 1993. Lots of fantastic history, though very little of it is focused on the WWI home-front. Marlow, Joyce (ed. ), The Virago Book of Women and the Great War. London: Virago Press, 1999. Though focused on Great Britain (like most other books on women during WWI), this collection of letters and diaries from from women of all walks of life provides a wonderful female perspective on the war. Marwick, Arthur. Women at War: 1914-18. London: Croom Helm Ltd. 1977. Page 130 reproduces Evans’ To Women War Workers: Some Homely Advice in Regards to the Maintence of their Health & Comfort – with detailed advice on dress, hygiene, what to do ‘At Certain Periods, and in case of ‘certain personal diseases.’ It’s set in the UK, but still the most detailed description of personal care of the period I have encountered. Nicholson, Virginia. Singled Out: How Two Million Women Survived Without Men After the First World War. London: Penguin Group. 2007. British. Rees, Peter. The Other Anzacs: Nurses at War, 1914-1918. Cros Nest, NSW, Australia: Allen & Unwin. 2008. Interesting, but the usual NZ female WWI perspective: nurses. Nicholson, Heather. The Loving Stitch: A History of Knitting and Spinning in New Zealand. Auckland: Auckland University Press. 1998. 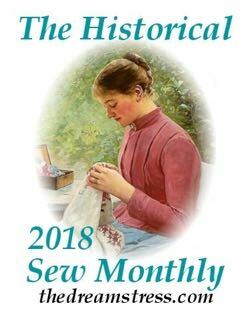 An excellent overall history of knitting and spinning, with detailed chapters on WWI and the pre-war years. I have a slight theory, developed independently of this book, but related to its topic, that knitwear may have been more acceptable in a wider range of settings in NZ in the 1910s than in much of the rest of the Western world. 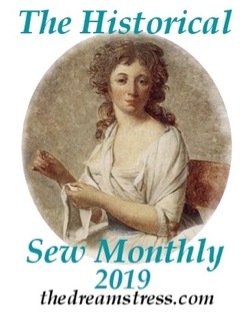 My theory based on the number of photos of women of all walks of NZ society in knitwear in the 1900s and 1910s that I came across. I’d need to do significantly more research before I felt comfortable saying this was a definite quirk of NZ fashion, but it did influence the inclusion of a cardigan in my WWI wardrobe. Salen, Jill. Corsets: Historical Patterns & Techniques. Hollywood: Costume & Fashion Press. 2008. I used the 1916 German Ersatz Austerity Corset as the basis pattern for the corset I wore throughout the project. Waugh, Norah. Corsets & Crinolines. New York: Routledge/Theatre Arts Books. 1954. Excellent information on 1910s corsets and undergarments. Waugh, Norah. The Cut of Women’s Clothes. London: Faber & Faber Limited. 1968. Excellent information on garment cuts and construction techniques used in the 1910s. This is a wonderful list! My goodness, you put so much effort into this project. Your NZ knitwear acceptability theory makes good sense to me, especially considering the huge wool industry. I’d love to know what else you find out about it. Is now a good time to say that I would love to see more of your own book collection? 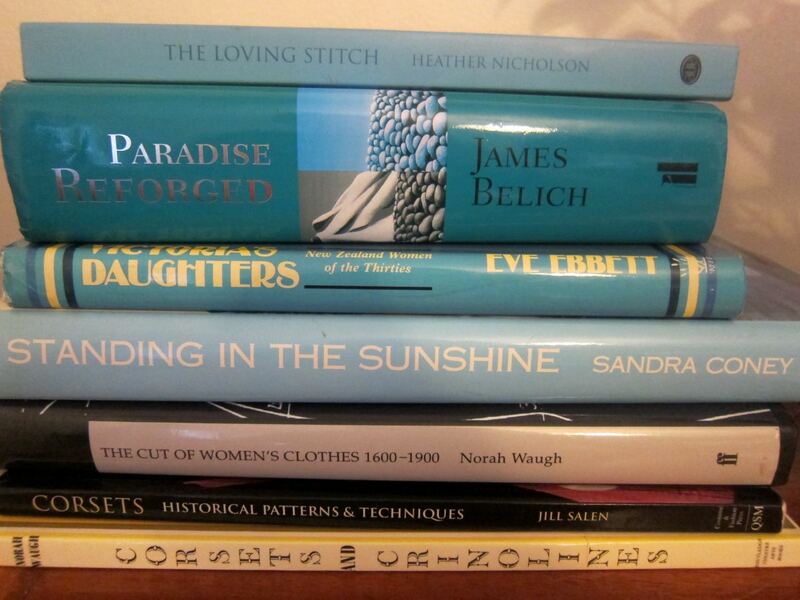 One of the sewing photos during your fortnight project included your bookshelf, and it made me curious to know what you considered worthy of owning. Thank you for this. Riches! The New Zealand kitchen in the 20th century”. And yes, it is on Amazon, but not in e form. Such a shame. I mean, who wouldn’t want to read a book that includes the line, ‘You could say that the 1930s saw the highpoint of Macaroni Cheese.’? So many other good things, too. Wondering if you have had a look at the vast selection of books scanned as part of the google books project. I have a chart goo.gl/su8ZfR which is just the few dozen I have taken a look at. All of those are free and complete. 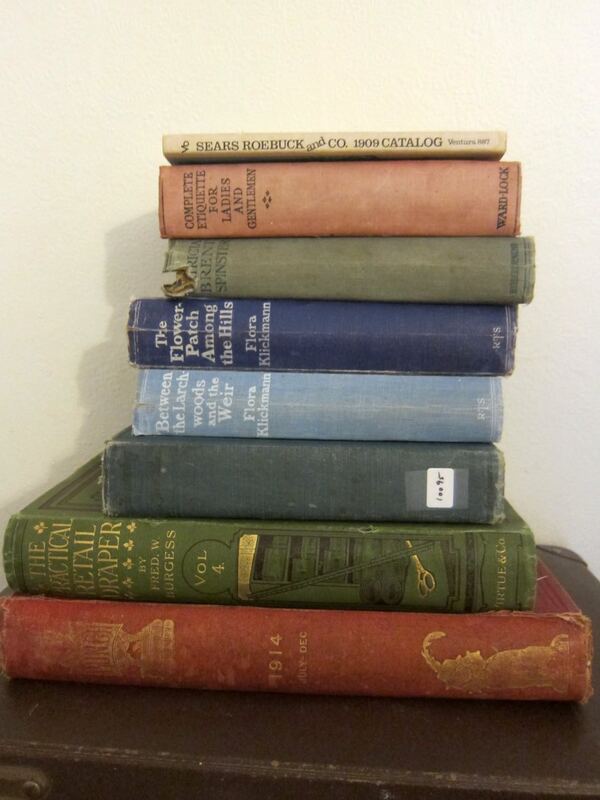 I used to have a modest collection of vintage homemaking and etiquette books. They were fascinating and wonderful! It seems that you also found yours to be helpful, and it brought back a lot of giggles about stuff I had read. And second for the kitchens book! I want to read it! When reading your list, I wondered why Australian books were not included. You included British and Canadian sources, wouldn’t the Commonwealth country nearest NZ be helpful? Finally, does NZ have a version of the Junior League or the W.I.? Such women’s clubs are replete with wonderful wonderful wonderful first sources. If I bring a big squidgy chocolate cake, may I just come sit on the floor in the corner and READ?!? I really enjoyed Rilla of Ingleside as a novel, but if it’s relevant for anyone’s historical research, there are a whole pile of similar Stories For Girls on Project Gutenburg by Angela Brazil. She started writing them about 1908, then they were published right through the war and out into bobbed hair and short skirts in the 1920s. So, they’re just “modern day stories” and as such a fascinating insight into little details that were considered “normal” at the time. Being teenage girl heroines, of course, they fret about fashions and cooking and brothers-gone-off-to-the-war. And more, they’re illustrated! I’ve read one of Angela Brazil’s books (The Fortunes of Philippa), but I don’t know all that much about her other stuff. Are there any you especially recommend? I love these kind of books. They feel like time capsules. I know Fortunes of Philippa! Time capsules – exactly! For both time-capsule-ness and a light but enjoyable read, I’d have to recommend The Luckiest Girl in the School and The Jolliest Term on Record. They’re both set during WW1, and so there’s loads of historical detail, but not too crazy on the plots. Some of her others written during the war have escaped spies/Germans etc, which while interesting in terms of what people wrote and read then, is a bit far fetched for real life. A nice one from after the war is A Fortunate Term. I think The Fortunes of Philippa is probably the best pre-war. Sorry to be borrowing your blog to talk books, Leimomi! I’d be mad if you were borrowing my blog to talk politics, but I’ll never* complain about books! Thanks for sharing these resources! I hadn’t realized Rilla (one of my favorite LMM books) was such a rarity when it came to contemporary WW1 novels from a woman’s perspective. But thinking over different books/films from that time that I’ve encountered, it’s weird how oddly disconnected they can feel. Sometimes you can read through them and not even realize there’s a huge war happening overseas. (Possibly that’s because a lot of the books I come across are US-based, which came into the war quite late.) By comparison, Rilla feels a lot more immersive and just … aware of what’s going on. gutenberg.orgThe Fortnight in 1916 was really interesting to follow and I really enjoyed the peek at your research! Have you ever searched Project Gutenberg (https://www.gutenberg.org or http://gutenberg.net.au/ ) for WWI era source material? I used to be a volunteer proofreader for PG and I remember working on several books a few years ago in honor of ANZAC Day. The books posted by PG are all in the public domain and are all free, so it might be worth a look. Next PostCome and hear about the Fortnight in 1916!